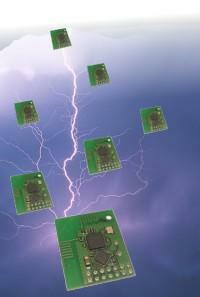 Free Programmable AVR Radio Modules and Boards for Wireless Sensor Networks. The iDwaRF radio modules utilize the worldwide unlicensed 2.4GHz ISM frequency band and uses a robust Direct Sequence Spread Spectrum (DSSS) transfer method with a data rate of 62.5kBit/s and a 50m range. The low standby power consumption of <10µA is ideally suited for battery powered wireless sensor networks. To support the simple setup of wireless multipoint-to-point (N:1) networks the royalty-free iDwaRF-Net firmware is available for download. The protocol aims at a reliable bidirectional communication between one hub and many sensors or actuators in N:1 networks and goes far beyond simple point-to-point (1:1) wireless solutions. The full protocol (e.g. error detection and correction, automatic channel selection, etc.) is encapsulated under convenient C-functions and can easily be extended by user-specific functions. The iDwaRF-328 module and the iDwaRF-Box can be set up both as hub, as well as sensor or actuator module.